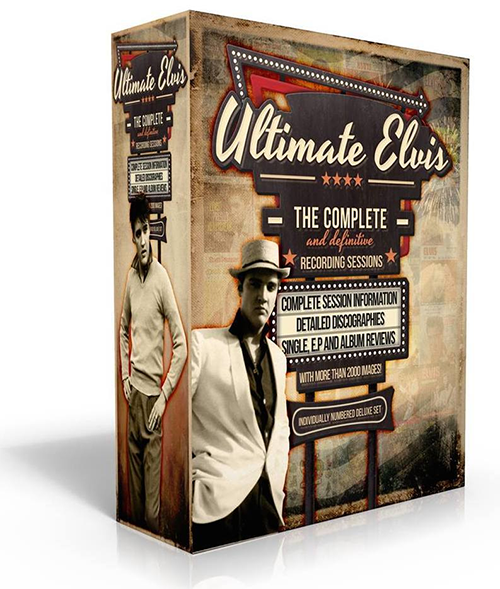 Erik Lorentzen's Ultimate Elvis is what it should be: one of the biggest Christmas presents ever. It is out and on its way to the dealers! OK Viva, my well meant appologies ! Just checked the explanation on the Belgian site. They apparently contacted Eric Lorentzen, asking why the boxes were not numbered. Seems Lorentzen couldn't come up with a valuable explanation but offered to send a list with the appropriate numbers for the boxes each dealer ordered, so they can/could number them by handwriting. Strange way of handling this imo. Agreed, as you wrote, not so important (to me anyway). Merry X-Mas and peace to you and all of you on this site. Always El. My remarks were not meant to offend you Ben. However I am curious as to why they were not numbered (not that it matters that much). Whetherman, I'll pick up my copy next Wednesday at my dealer. All the boxes being in his possession are NOT numbered, so if I ask him to WRITE number 109 on it..... see what I mean ? Always El. Main point was to make clear the boxes have not been numbered by the original editor/manufacturer, so being able or not to read a foreign language doesn't matter that much in this case. The second part of my posting was understandable enough imo. VLV :Happy with your remark(s) ? I guess you are . Always El. Not much point in telling us the explanation is on a site few of us can read!! Can anyone elaborate on this little mystery. By the way, am I the only one who is slightly disappointed with the quality of the slipcase. It's OK but really should have been of a similar quality to the books. (this is only a minor nit-pick). Also, mine arrived in very minimal packing, no bubble wrap or additional padding - thankfully it didn't suffer any knocks. Anyone else have any comments on this? My copy arrived numbered. Number 109, hand written. Surely others have had numbered copies. (incorrect) 'nr 1'. Always El. My copy arrived this morning. One thing I've noticed, the box that should contain the limited number is blank. Anyone else have this happen? ROYT.. You'll really enjoy the book. So comprehensive and well laid out . I'm surprised there's been so little commentary on the book on this site. On another Elvis site there are over 750 posts about Ultimate Elvis. I have decided to order the book yesterday through essential Elvis price at £155 plus £10 postage which I think is a good deal for three bumper sized books crammed with information and photographs and the whole weighs a whopping 10k this is certain to go up in value as its limited to only 3000 copies . I got my copy of this set of three books and slip case today. Incredible amount of content with tons of info and photos from Elvis's sessions . Probably the last word on Elvis recording career. Very expensive but worth it ! Correction : should be "pages offline untill january 2015". Always El. Gorse, Natha, the now offline Keith Flynn pages will be available again from 16 january 2015 on, according to Keith himself. Just check his site. Have a nice weekend all of you ! Always El. Gorse , any "new" info found will be made available & updated on the author's site . As for the cost of the set ; you can get a "special" deal if you order it directly from him. Hope that could help. Looks very impressive but I guess so also will be the price.!! Is this why the sessions of Keith Flynn disappeared. My unrealistic hope for 2015 is that this magnificent tome might be have to be edited because a new recording session is found. - dream on Gorse. "It's Beginning To Look A Lot Like Christmas......."